Good news! Our kitchen has been repainted and the workers are almost done installing the new cabinets and fixtures. The stove isn’t hooked up yet so we have to use our old stove for now. Unfortunately they moved it to a part of the kitchen that doesn’t have an electrical outlet so no oven, but the gas works (it’s a cylinder) if you light it with a match. 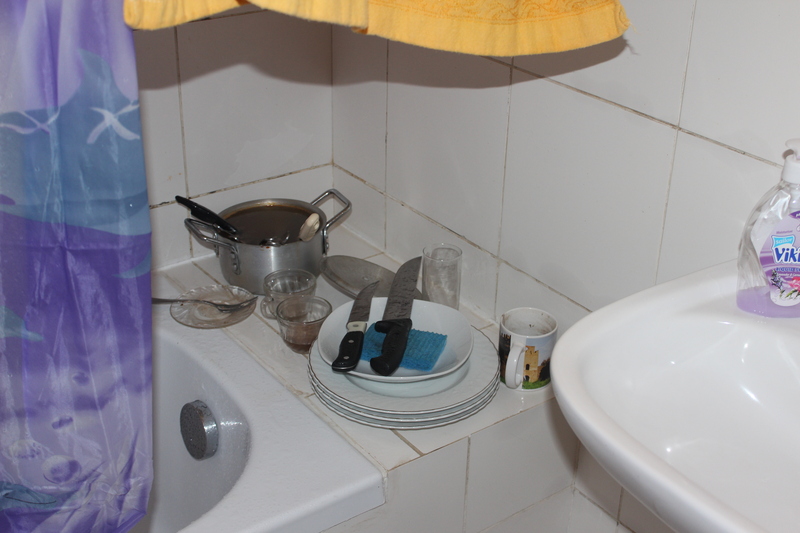 Can’t say the same for the sink – we’ll have to wash our dishes in the bathtub for a few days. But it will be worth it. In truth, it’s our housekeeper who’s going to have to deal with this. She has my sympathies. I had to wash dishes in my bathroom for three weeks until I got my kitchen faucet replaced (long story). It took twice as long.